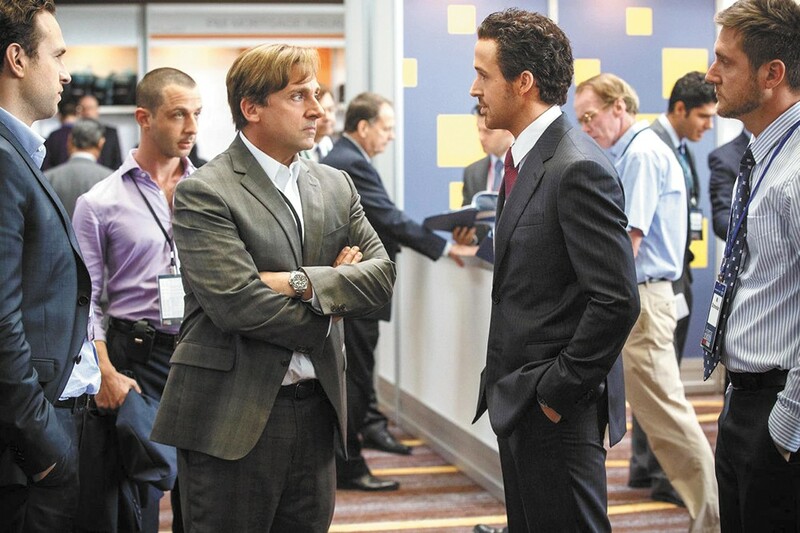 Steve Carell and Ryan Gosling dig deep into the mortgage crisis. I don't know about you, but if I were thinking, "Who should make a movie about the 2008 subprime mortgage collapse?" my first answer would not likely be, "The guy who made Anchorman." But that counterintuitiveness is almost exactly what makes The Big Short so effective. Adapting Michael Lewis' nonfiction book with Charles Randolph, Adam McKay lays out the stories of the investment banking insiders — including fund managers Michael Burry (Christian Bale) and Mark Baum (Steve Carell) — who saw the mortgage collapse coming as early as 2005, and began to realize how much the game was rigged. The subject is, of course, an insanely convoluted one — full of arcane banking terminology and horrible behavior by banks, government regulatory agencies and bond-rating companies — that resulted in a cascade of bankrupt businesses, lost savings and unemployment. McKay, however, refuses to turn it into a parade of somber finger-wagging. He wants his audience to understand what went so horribly wrong, not just feel angry about it. And he commits to that notion with puckish meta-humor that includes asides like, "Here's Margot Robbie in a bubble bath to explain it to you." There's too much ground to cover for the individual characters' stories to make much of an emotional impact, despite McKay's efforts at conveying, for example, the grief driving Baum's righteousness. But The Big Short has a snappy energy that turns one of the most maddening events in recent history into something where all the greedy pieces suddenly make sense — even the greedy pieces who are, theoretically, our protagonists, as we're reminded that being right about this Jenga-unstable situation means real economic pain for real people. The Big Short is not showing in any theaters in the area.